Sharing recipes that your family has passed from generation to generation is a wonderful gift that will surely be cherished and treasured. These heritage sliding recipe boxes were made using the beautiful Wintertime in Swedish Lapland papers. The numbered list of the different recipes are on the top of the box and you simply pull out the corresponding numbered side tab to reveal the recipe. The method of making this special gift is shared below just for you. Cut 2 pieces of cardstock each measuring 6 1/2″ x 12″ and score each at 5 1/4″ and 6 3/4″. Join these 2 pieces together to form the base cover for the box. Cut 2 pieces of cardstock each measuring 3 7/8” x 9” and score every ½” along the longer 9″ side. Cut 2 more pieces of cardstock each measuring 6” x 9” and score every ½” along the longer 9″ side. Take each of the 6” x 9” pieces and lightly score at ¼” on each of the 6″ sides. Skip the first score line and make a cut line on the next score line between the two ¼” score lines on either end. Skip the next score line and cut again between the 1/4″ score lines. Repeat this six more times skipping every other score line. Fold each piece like a fan making sure the cut scored lines are the “valley” folds facing the outside. Cut 8 cardstock rectangles measuring 6” x 4”. These pieces will serve as shelves to hold the recipe cards in place as they slide in and out. Apply score tape to 8 sides adjacent to the cut scored lines on both 6” x 9” pieces. This side will face the inside of the recipe holder. Starting at one end, remove the Score-Tape backing and carefully line up one of the 6” x 4” rectangular shelf pieces to the score line and outer edges and adhere. Repeat this step for the rest of the sides. Once these are all adhered, begin lining up and attaching the other ends of the 6″ x 4″ rectangular shelf pieces to the score-taped sides of the other 6” x 9” folded piece. Now insert the shorter folded pieces on either end and adhere the ends. Make 8 tabbed recipe cards to insert into the side slots. The cards should measure 3 7/8” x 5 ¼”. The tab should extend about ½” from the card and be 1 3/8” length. There are 8 slots for the cards. For 4 on each side, skip a slot between cards. 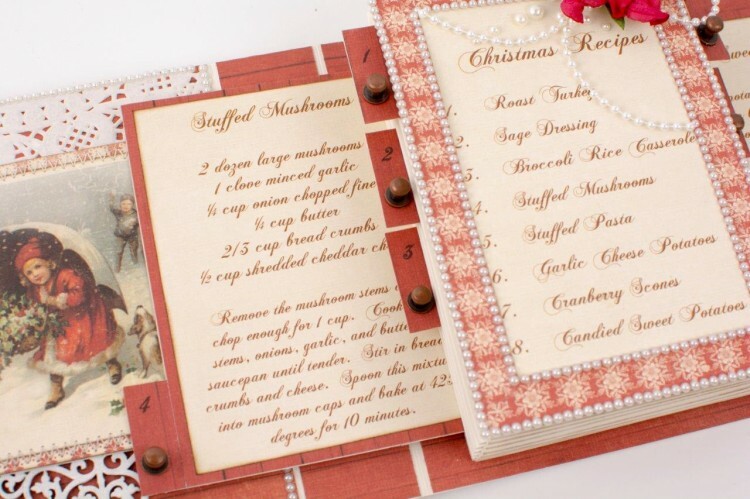 The skipped slots will contain recipe cards on the opposite side. Center and adhere the recipe holder onto the base cover as shown in the finished project photos above. 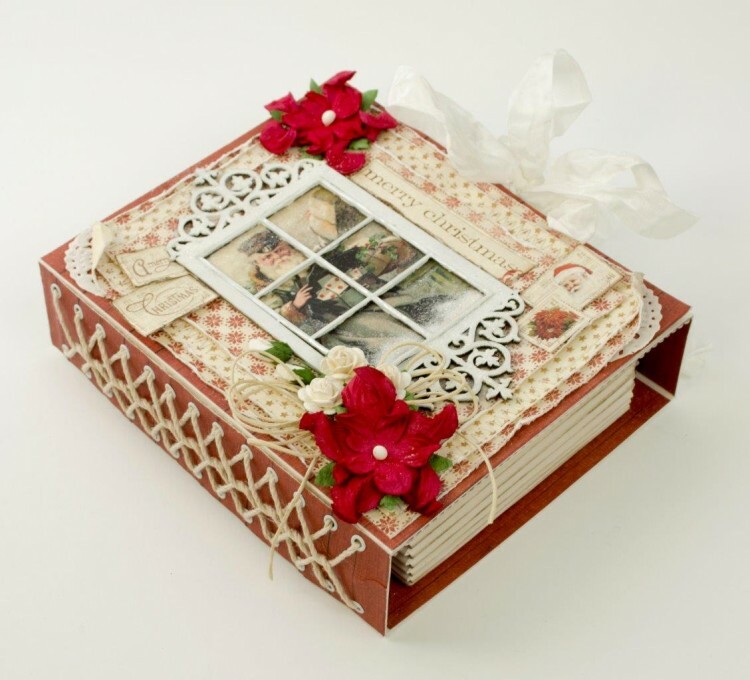 Your sliding recipe box is now ready for decoration with the beautiful Pion Design papers. Hello, I really love this recepiebox, thanks for sharing it with us. Wow, what a wonderful idea, thanks for sharing, I’m off to try this out, today. Parabéns pelo belo e criativo projeto!